A major shift has just occurred in our timeline and experience of the planet. For the first time on aeons, the physical body can now begin to CONSCIOUSLY observe and sense multidimensional reality. This means big changes in the way the body functions. Big upgrades are happening at a cellular level, in particular around the throat and upper chest, neck and shoulders. If you are experiencing lack of sleep, be aware that Consciousness is inviting that you are physically AWAKE during these changes so that the body learns to sense multiple realities. A blur in distinction between being awake and asleep is also commonplace now, and not just at night! October is the beginning of the PHYSICAL body being aware of our new capacity to know, communicate and direct reality. Eyes, ears and voice are all experiencing new formats and tones of perception. created leaves an imprint. These are the golden footprints. Imprints that are left behind for future generations to create upon, because humanity cannot continue to repeat from the past. This is why you are coming to the end of your cycles of belief. You are creating imprints for new experience. You have just ignited a dormant system within the human physical body that has not been in use for more than 340,000 years. Those of you that have been feeling the discomfort in the neck and the upper shoulders and the tightness in the head – we want you to understand that you will be experiencing more relief from that now because you have just reignited what we would call the EKBAH. The EKBAH has been virtually unknown to humans because it is not a part of your informed history, but the EKBAH is as important, if not more important than what you have understood to be the pineal, because it is the expression of cosmic truth. You have understood that there is something in the human body called a chakra here, but the chakra has been an overlay that has not allowed the EKBAH to be truly expressed. The EKBAH works in conjunction with the pineal. The pineal has been the translator between Cosmic Mind information and mind-brain and was originally installed (or activated, as we would say) so that information could come into this reality and be translated into 3rd dimensional logic – so concepts could be understood. When the pineal was disengaged (or decommissioned), it meant that humans would just rely on the mind-brain for information and no longer the Cosmic Mind, thus forgetting that the mind-brain was just the translator and the tool for the Cosmic Mind in this reality. However the EKBAH is the expression of Cosmic Mind and it looks not like a gland it actually looks like a geometric key, and this is why some of you are feeling the discomfort. What this was designed to do was to allow the original blueprint of the human vehicle to adequately communicate Cosmic Mind. This has been problematic for many of you because you know what you sense beyond your physical, but you can’t express it. You can begin to have glimpses of it once your pineal gland is reinstated. So you start to have visions of what this means, or you start to be able to map out what it means, but you are not able to find the expression to communicate it and so you become very isolated in your experience. The EKBAH was designed so that Cosmic Mind would flood it, there would be an expression of truth, of totality, of universal law and then the pineal would be able to assimilate it into mind-brain logical sequence so the knowledge could be replicated. So this is what has been missing for you – your ability to speak what you know. That is what you have just reactivated. So what this means for you in your own personal experience is that you are going to be expressing more of what you know. But there is fear there for you because you are so used to being conditioned to having to understand it here before you say it.That is why many of you will say “well I have something going on to speak of, but let me think about it for a moment” instead of giving yourselves permission to express what it is the Cosmic Mind wants to express. You don’t have to understand it first. It will be understood. It is not your role to understand it before you express it – that is not why you are here. It is perfectly in accordance with creation if you do not know what you are expressing. You are also reinstating the original coding in the DNA where of course the EKBAH was part of the original human blueprint. So this is more of a physical and etheric effect of everything that you are doing. We are explaining this to you because we want you to be exceptionally clear that you need to be communicating what you don’t know! It is very very important. We have spoken with you about the energetic footprints – the imprints. Do not underestimate that your voice and the tonality of your voice relays information. Sound is information, sound is coding. You don’t have to understand it first but we guarantee you if you give yourselves permission to start expressing whatever it is that is there, whether it be sound, whether it be words, whether it be anything that arises from within you then not only is that leaving an imprint behind but it is relaying information. 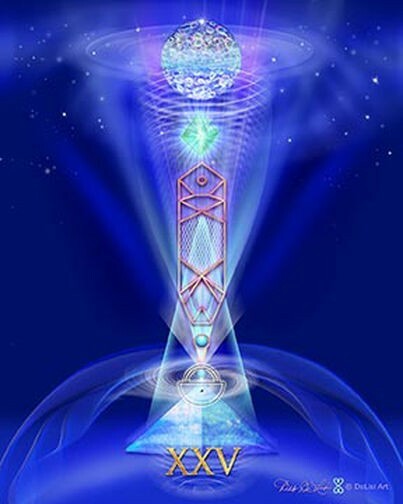 It is relaying vibrational information that is required at this time on the planet for new structures to be built. You are the walking blueprints of the original humanity therefore you are the walking blueprints of the new humanity. Every time you express your sound, every time you communicate, you leave an imprint – a blueprint for generations to build upon. If there is a feeling of resistance in your body in the next days you need to speak your way through it. If there is discomfort and pain in the neck you need to speak your way through it. You need to sound your way through it because this is just waking up again and it needs a little bit of exercise. It is the same as when you have a sore muscle or a muscle you haven’t used for some time, it feels quite cumbersome and it just needs to warm up a little bit. **Notes: The information about the EKBAH was first received on Sept 16th 2017 in San Francisco and again on 24th Sept 2017 in Ohio. Deb DeLisi’s artwork “Level 25” Sound Geometry (above) depicts the energetic expression of the EKBAH and it’s functioning in the human body and etheric field. Special thanks to Deb for her extraordinary vision and wisdom.